My love for chicken is unavoidable whatever preparation it may be. I and my wife Manasi have tried many chicken recipes – some from cooking shows, some from blog posts and even some from cooking books as well. But our love for eating chicken has never diminished. We love to try different chicken dishes in restaurants and some we have liked and some had not been able to tickle our taste buds as we had expected. But never mind, we have not stopped trying new stuffs whatsoever. Like how we try new chicken dishes in restaurants, we have not stopped experimenting with various recipes of chicken. When it comes to experimenting, we try give a twist to some existing chicken recipes and sometimes we come up with something creative from our creative mind. Yes of course some goes well and some do not come out well as we would have expected. But that had never hold us back in trying something new as far as experimenting is concerned. 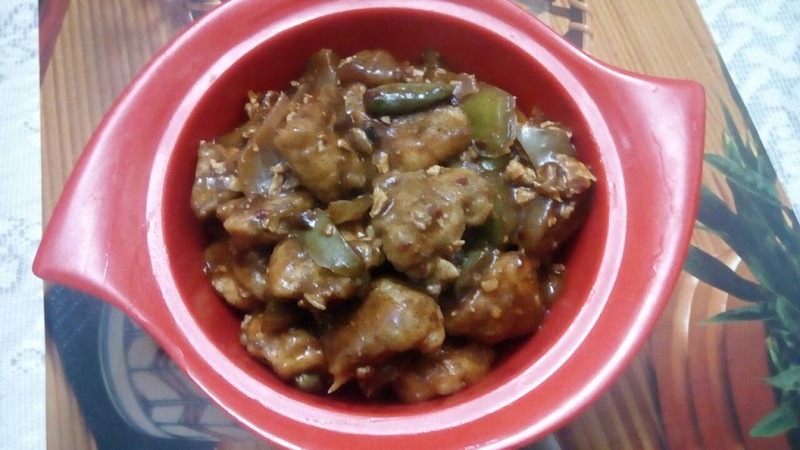 With the zeal of experimenting new stuffs I and Manasi thought of giving a bit of twist to the well-known recipe of chilli chicken and see how would it come. Let me share the recipe with all you people. The change that I tried in the recipe was not using vinegar to marinate the chicken pieces, which did not offer the typical chilli chicken taste. I had used black pepper powder for the marinade. The other change I tried out here is the Oyster sauce while cooking and less of soya, tomato and chilli sauce. The experiment was successful and it tasted a bit different than the regular chilli chicken. I liked the taste of the recipe and would like to try it again some time!! Am a fan of chili chicken and keep cooking it at home. Today I thought to cook in your style. It’s flovours are igniting the taste buds. Very delicious. Thanks so much Punam for your kind words. I’m glad you tried the recipe and you liked the taste. This was a twist as I like to experiment with food. This was one of them.